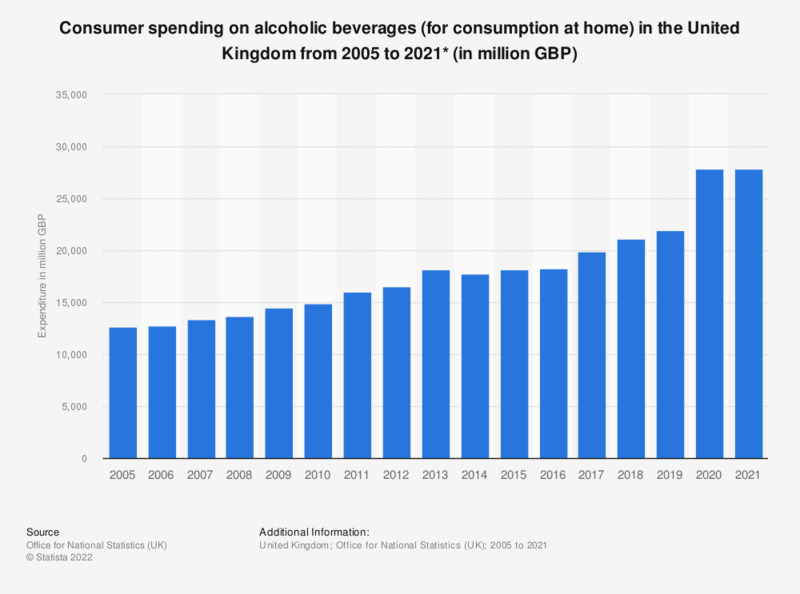 This statistic shows consumer spending on alcoholic drinks in the United Kingdom from 2005 to 2018. According to the data, expenditure increased over the period in consideration, reaching 21.1 billion British pounds in 2018. Compared to 2017 this constitutes an increase of approximately 1.3 billion pounds. * Household final consumption expenditure. Figures based on current prices, seasonally adjusted. Alcoholic beverages refer to those purchased for consumption at home. Excludes alcoholic beverages sold for immediate consumption away from home by hotels, restaurants, cafes, bars etc. These are included in the data for restaurants. Everything On "Alcohol consumption in the United Kingdom " in One Document: Edited and Divided into Handy Chapters. Including Detailed References.